If this evaluation were based solely on personal experience then Dank Vapes cartridges would be a solid 4/5 product. They have been great tasting, carried a good clean high and enjoyed a decent lifespan - pretty much ticking all the boxes. Eagle-eyed cartridge enthusiasts may have noticed a fair amount of commotion surrounding Dank Vapes cartridges recently. While they are well known for their easy availability in non-legal states, some people seem to be getting great vapes while others ... well - you fill in the blank. Looking at the issue impartially it is pretty clear that the brand name is being used by multiple people who are offering some wildly different standard of product. Whether or not this is being condoned or condemned by 'Dank Woods' - a mysterious entity claiming ownership of the brand - is unclear. They didn't respond to our Instagram request for some clarification so to say the situation is murky would be an understatement. 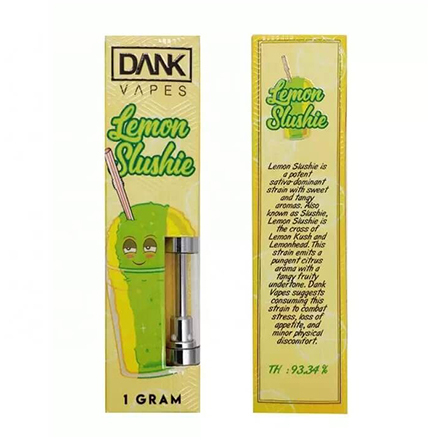 Regardless, the Dank Vapes brand is one of the most popular and widespread out there. So we're going to base this evaluation on our personal experiences with the product, and also assess the opinion of other people who both praise and slate it. Our conclusion may surprise you. First things first, and our first red flag, comes down to how much the price varies depending on where you are. In legal states, you can pick up Dank Vapes cartridges for as low as $25-30 and even as little as $40 in those still enforcing weed prohibition. No matter how you look at it that's seriously undercutting the opposition, and no doubt one of the reasons behind the recent surge in the brand's popularity. Dank Vapes has over 20,000 followers on Instagram and that's enough to tell its own story. But why does the price fluctuate so much? Sure, there is always going to be the extra 'risk tax' in non-legal states - but even in those markets the price still varies considerably depending on your selected vendor. Why should there be a $15-20 difference for a product that claims to be identical? Hopefully, you have already figured this out - it is because the black market is swamped with people ripping off this brand and selling low-grade cartridges. Hop onto Amazon and do a simple search for "Dank Vapes Cartridges Packaging" and you'll be surprised at how many hits you'll find. Replicating vape packaging is incredibly easy. For one example, you can get a pack of 50 units for just under $30. Needless to say, this is very tempting for unscrupulous growers to camouflage their oils (usually made from low grade/mildew infected offcuts) in what many people believe to be premium quality packaging. What may have been a few dollars worth of product can then be sold for eight times the price at an outlay of less than a buck a cartridge. If you check out social media you'll find wildly different user reviews about the quality of the Dank Vapes cartridges. Most of these tend to come from banned states where it seems those next door to legal states have enjoyed - on the main - quality cartridges and those far away have been sold garbage. It is the only way to account for the differentials in quality. Yes, one person's great may be another persons 'meh' but there is always a gulf between great and utter garbage. So either Dank Vape Cartridges are being thoroughly bootlegged or they're in on it. Quite a few people have paid out of their own pocket to see what gives with the cartridges they have received. Some - but far from all - have been understandably alarmed to discover the presence of pesticides. Nasty as that most assuredly is, but once again it begs a serious question. Why is one person's cartridge reported as polluted while others are fine? The only answer has to be the quality of the bud and the clear fact that it is being grown and almost certainly sold by entirely different people. Moving on to the THC content. Almost all listings for Dank Vapes cartridges claim a staggering 90% THC, which for the price point is literally unbelievable value. Having conducted our own research into this, we can report that the batch we tried was pretty good actually but not exactly 'knock your block off' levels. Once again, those who have had their cartridge tested report an average of around 60% - which makes their price point much more realistic. Good enough but not amazing. One of the reasons behind their success has been an enormous variety of flavors. These range from the familiar to the rather more out there - 'Durban Poison' or 'Gelato' anyone? Either way when these guys first hit the scene much of their popularity was thanks to the quality of their range. Again, from personal experience of the ones I have experimented with they are really good. But once again not everyone is satisfied. Social media has recently been packed with people complaining that their cartridges taste like motor oil! Again - almost all of these anecdotes come from illegal states. Further proof if needed that quite a few people are hijacking this brand name. It is simply too difficult to trust this brand for quality if they/someone else is selling their crappy oils under their formerly trustworthy name. Take once again to social media - Reddit is perhaps the best choice - and you'll find endless examples of people in legal states saying that they wouldn't go near Dank Vapes despite it significantly undercutting other options. This is because the product quality varies so much and even states where you can pick and choose at liberty have been infiltrated by a substandard quality product. If this evaluation were based solely on personal experience then Dank Vapes cartridges would be a solid 4/5 product. They have been great tasting, carried a good clean high and enjoyed a decent lifespan - pretty much ticking all the boxes. Yet the problem is that something seriously bad is going on with their brand being manipulated. Make no mistake - they are not the first and will not be the last - to be ripped off in this manner. Some have speculated that whoever is behind the brand may even be responsible for the huge differential in quality, basically running the show as a franchise while not manufacturing anything themselves. While possible we think it's not exactly plausible as someone in the industry would have played whistleblower way before now. Most probably they are being ripped off by someone making a killing reprinting and selling their packaging. 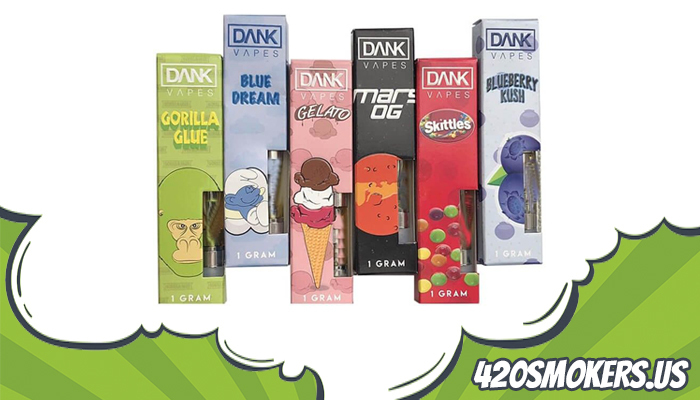 Either way, for the time being, we can only recommend Dank Vape cartridges if you already know what you are going to get is of assured quality. Always look before you leap and if something is too good to be true it almost always is going to be a knockoff scam.